A student who was found dead two days after he went missing has been described as kind and loving. 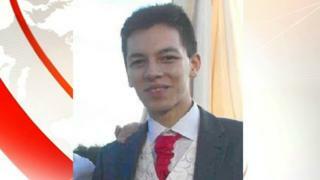 Ian Tang, 20, from North Walsham, Norfolk, disappeared while walking home from Club KA in the town in the early hours of Sunday. About 200 people gathered to search for him on Tuesday morning and his body was found just over an hour later. His body has now been formally identified. The death is not being treated as suspicious, said police. A crowdfunding page set up to fund his funeral has raised more than £8,000. The online fundraising site was set up by the Norwich City College student's cousin Reana Zagni. On the page, she wrote: "Ian was a kind loving man who didn't have a bad bone in his body. "He always knew how to make someone laugh and whenever we saw him he always managed to make people smile with the things he said and did." Pupils from Mr Tang's former school, North Walsham High, paid tribute to him at their Christmas carol service at St Nicholas' Church in North Walsham on Wednesday. Paul Leaver, assistant head teacher, said Mr Tang was a model student. "He was quite a quiet boy, he was always a hard-worker, very studious and always tried very hard," he said. Mr Tang's body was found on Mundesley Road near the village of Swafield, by a member of the search party . Friends of Mr Tang, who worked part-time at a gym, said he was offered a lift home from the club but he decided to walk back alone, leaving just before 03:00 on Sunday. He was last seen on the B1145, Mundesley Road, on the outskirts of the town between 05:45 and 06:00.